You can tell by the material list that this is a creation using only what I had on hand – no shopping. That’s the beauty of it. 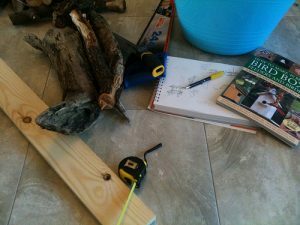 You’ll notice in the photo below a book on bird feeders and boxes; it’s inspirational, but assumes you’ve got materials or are willing to go to a craft store for some stuff. Heh. Not today. First I drew up some designs to best use my minimal materials. I ended up using all my proper timber but about a half inch strip of plank. Not bad. I cut five equal planks from my pine board, laid them down and screwed them together with the help of some flat metal brackets. This part has to have some stability, so the hardware was needed. Also, always drill pilot holes before putting screws into wood – it’s not only easier to assemble things, but it’s going to save you from splitting your precious scrap wood. Use a smaller diameter drillbit than the screws you’re using. 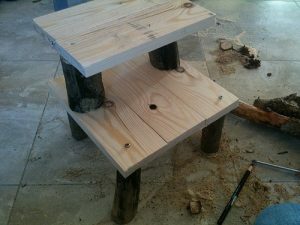 Assemble the other two plank bits in a similar way for the second, or “penthouse” level. Moving right along: Cut some skinny logs into level(ish) 5 inch lengths. You’ll want four for the “first floor” supports and two fatter ones for the “penthouse” level. 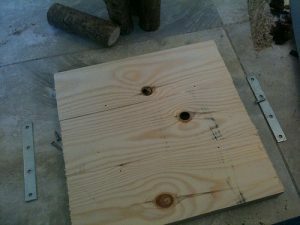 Make sure you’ve got good, long screws to plunge through the floor planks into the logs – you don’t want wobbles. Don’t worry if things aren’t totally level; I promise, the birds won’t care. Now, screw on the sticks. Birds love the sticks and if you have one that still has a few branches, all the better. Use it on top and they’ll feel more at home with these extra perches. 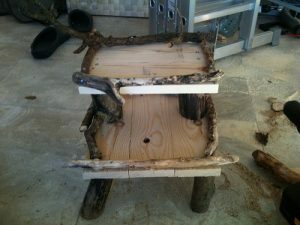 The sticks should lay as flat as they can on the planks, then pilot drill and screw them in place. If you have a few little gaps, it’s OK. It’ll let air in and help dry things if they should get damp. 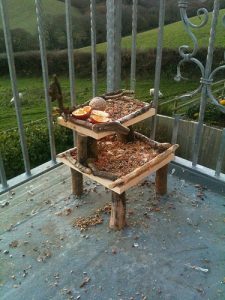 Finally, place your rustic double decker bird table outside and fill with seed, sliced apples, and fat balls. Your wild birds will go bonkers. You might notice that there is a metal bit of brace sticking up on the side of my second level; I put a flat t-bracket on the side so I’d have holes to attach my feeder to the balcony railing when we get high winds. We’ve had as many as twenty birds on and around this thing at a single time, and they’ve been extra greedy during this cold snap. I also found that pouring melted fat balls directly onto the levels works well too, as it cools quickly and hardens. The birds make less mess with it, and they still peck up every last oily bit. Want to make your own fat balls? I’m going to do a post on that too. Stay tuned!